The Masters trophy will be renamed the Paul Hunter Trophy from 2017 in honour of the three-time winner, says World Snooker chairman Barry Hearn. Hunter died from cancer at the age of 27 in 2006 and Hearn said on Wednesday that the sport "messed up" by not paying tribute to Hunter sooner. "It's the highest honour we can give," Hearn told a media conference. "There is an argument to say we should have done it before and I take responsibility for that." The Masters, one of snooker's Triple Crown events along with the World Championship and the UK Championship, will be rebranded from next January. "The 10-year anniversary probably triggered a feeling," Hearn added. "We messed up. "Rather than hold your hands up and say 'we should have done it', let's do something about it." Hunter turned professional at the age of 16 in 1995 and won his first major title, the 1998 Welsh Open, at the age of 19. The Leeds player won the Welsh title again in 2002 and picked up the British Open trophy in the same year, but he will be best remembered for his exploits at Wembley, where we won the Masters in 2001, 2002 and 2004. Hearn said Hunter's "mercurial talent" was a "sad loss" to the game. "When people talk about personalities, Paul was there in spades," Hearn added. 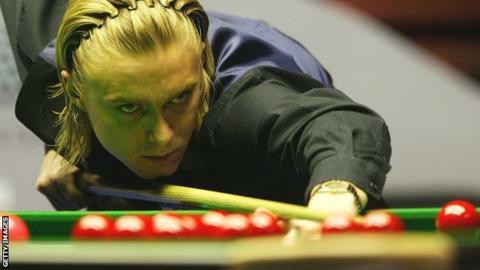 "The Masters will always be played for the Paul Hunter Trophy. Who knows what stamp he would have made on the game? This is a gesture to appreciate that."